"Capable platform with a few key missing features"
I appreciate the ease and simplicity of adding course evaluations that are tied directly to an ILT and the instructor of that iLT. I also appreciate that we've been able to customize the permissions for various admin groups so we can allow facilitators certain permissions without allowing them access to everything. I also appreciate the ability to create custom pages and custom welcome pages for various groups. Overall, the customizability is great. Reporting is lacking. A stable production-ready Reporting 2.0 can't come soon enough. We need more robust out-of-the box report that non-admins can use to pull report for whole groups, not just their direct reports. We use CSOD to facilitate distribution of our customer service training content. It provides a globally accessible platform where we can make ILT and online training available to all our CS agents. With CSOD, we've been able to increase visibility of completion statistics for required training content. We've also been able to create sessions and allow users to sign up for them on their own instead of manually assigning training via outlook meetings. "Robust and Customizable Talent Management Suite"
Cornerstone is a well developed Talent Management system that has a very robust list of features that are easily configured and branded to meet your organizational needs. The interface is user friendly and the "clouds" (Learning, Performance, Succession, Recruiting, Connect) integrate very nicely. Cornerstone is very customizable, brand-able, and configurable to meet many different Organizational needs. Customizations by Division allow us to support varying business needs. We support multiple co-op companies in our single portal, yet their experience is unique for their business. One of my favorite things about Cornerstone is the community--they have excellent staff and support team, and they provide many opportunities for Clients to engage with each other, network and share best practices and ideas. There is opportunity for clients to voice their needs and suggestions and they really listen to their customers. They have experienced some growing pains with their global product support team. They are vigilently addressing these issues with a redesign that has been improving the process for support. We have found Cornerstone to be a great tool to help us engage and develop our staff. It is highly configurable, and in such it's hard to discover all that it can do on your own. I recommend getting involved in the Cornerstone Communities of Practice, local user groups, and other networking opportunities. These are great resources to learn how other companies are harnessing the power of the system. I've learned and grown so much interacting and sharing with other clients. We primarily use Cornerstone for Performance Management and Succession. They have enabled us to implement a new staff/supervisor relationship model that encourages continual feedback. We've replaced our Annual Reviews with a process throughout the year. Staff and supervisors are building better relationships, work expectations and Goals are clear and trackable, staff are creating development plans, and they are getting the affirmation, coaching, and feedback that they need. "Cornerstone OnDemand provides us with the all the tools we need to assign and track our training." Two things come to mind - product updates being released before they are really close to parity to current and current wait time for Global Product Support. We are required to assign a lot training to very specific audiences - either by position, by date in a position or hired date, last time training was completed, etc. and report on completion. Cornerstone allows us to do this easily and our Learning Admins can do most of this on their own without Higher Admin support. Cornerstone also supports all the different types of training we provide - online courses, ILTs, vILTs, OTJ, etc. which is very important to our learning strategies and serving our diverse employees. "A great and complete tool to enhace the talent processes of any corporation." The ability to customize the tools of every module according to the organization, including when the organization is composed by different companies with different business rules. We love the fact that every action done through the portal leaves a record which can be reported, this helps us a lot with the human factor, the adoption. Support it has been a pain in the neck, as long as the platform tools work as it is supposed to, everything is perfect. But once something fails, it is really difficult to get the issue fixed soon. Service level agreements are really long. Also, cornerstone current app is really dissapointing we really expect to be able to do more actions through it and not having problems while doing so. Even though they have already started working on their customer support, we feel miles far away from the experience expected and offered at the selling point. We have also spoken with other companies and agree with this last part. We are not really solving any problems with the platform, however, our benefits come from the automatization of talent processes and its control. Cornerstone has helped us to keep on track every process from recruitment to succession matters. Recruitment: Requisitions management is much better, however it has made us loose a few candidates with the addition of the flows. Learning: We strongly believe this is the most complete module which has helped us a lot to keep users on track of their expected training, unfortunately mobility through the app did not work at its best. Performance: The combination of the goals, competencies and development plans tools are really helping us to obtain the best from our employees as well as to follow up their performance. Compensation: We finally have been able to automate the salary increase process, we have had a few difficulties on the road but still a good option. Succession: Great option for us to be able to apply 9 box metodologies and also being able to follow all of the different high potentials or successors. We also have the connect module, however we have not been able yet to make of this a great success since people keep complaining it should be an app where you keep automatically logged in (as facebook). "Outdated and difficult to use"
Overall, Cornerstone does what you need it to do. To be honest, I'm struggling to find something I like the best as it's all (IMHO), pretty poor. Although that said, I've only ever used open sourced LMS is the past, so CSOD might be the best of a bad bunch, who knows? Edit to my original review: DO NOT USE CORNERSTONE. Their customer support is, hands down, the WORST customer service I have ever had in my life. I WOULD NOT recommend Cornerstone to anyone. It's a very difficult user interface to manage (from an Admin perspective). Most things (including simple tasks) require many steps and screens with confusing fields with very little information about what's required. You're constantly pointed to the online help which appears to be written by a developer (difficult for a "normal" user to understand). Update the VERY outdated UI. Actually listen to users on Suggestion CIty - In over a year of using the product, I haven't seen one (useful) suggestion realised. Let admin users do more themselves - don't require a GPS ticket for everything slightly technical. IMPROVE YOUR SUPPORT. Your customer service is terrible. We mainly use the product for issuing and administering business compliance training. We do a lot of ILT which the system is OK for. "Learning better than Performance but support is lacking"
We use both Learning and Performance although there is very little linking the two products or a compelling reason to have both systems on the same platform. Their learning system has been around for along time and has a lot of good features and is being added to all the time. It handles both live instructor led training (ILT) and online classes as well as curricula that includes multiple live training. There are many things we can automate which is great for larger systems. Most of the administrator tasks are intuitive and the interface is being improved with each release. They handle new release management very well with great information on their support site, webinars on new features, good documentation and well followed timelines. Custom reporting, using a proprietary report builder works very well. I occasionally run into fields that are not available but I can usually get what I need out of the system. There are cons as well, listed below in the dislike section. Note - in some sections I said we didn't use the content creation capability - this is due to not using any native content creation. We use 3rd party content creation (Articulate and Captivate) to create SCORM content which allows quizes, videos etc and upload that for online courses. By far the biggest dislike is their support. Even with a high-priority issue that effects all users, it can take days to get a response from support. There is an online support system where I can log tickets/cases and then call in to "escalate" the issue but once it moves beyond the super simple, it takes 5+ business days to get someone actually working on the issue. We have a dedicated support manager but again they can do little to really get anyone working on serious issues. Luckily my issues are few but there is much frustration every single time. Their online support seems to have a lot of information but their search functionality to find what may be there already in terms of articles or in the communities is not useful at all. You can't use true boolean search to use AND for serveral terms so if you can to only include "Custom Reports" no matter what you do it will find Custom OR Reports which is way too generic and returns thousands of hits. You also cannot filter your search by a time frame so you also get a lot of hits from 2012 for example which isn't relevant to the current release. Many administrative tasks cannot be done in bulk - very click intensive on tasks. Also when you have filtered into a search, for example in your groups, then you edit and save one group you are returned to an unfiltered list and have to re-filter. It just makes things take a long time with way too many clicks. There are some functionality they have improved in this regard but much yet to do. In Performance, if a task is active, you cannot edit it. This is problematic for a task for ad-hoc performance reviews where the task stays open indefinitely. If you want to edit it, you have to create a new task but you cannot inactivate the old one or you cannot report on it or get to any of the PDF reviews created from it. You CAN pay support much money to edit it for you. Seems like with that happening there is not much incentive for them to allow admins to do the edit themselves. Groups need to have a few features added such as the ability to include active or inactive as needed for reporting needs. They also need the ability to use relative dates such as the hire date is 30 days from today. Currently you can only specify hire date is greater than 01/01/2018 so to use groups to auto assign onboarding curriculum to new hires, I must update my groups once a month to move that date forward. Although the custom reporting is nice and is being improved in one of the next releases, sharing a custom report is tricky as it doesn't allow us admins to organize the reports for our end users. We can share a report but it goes to the users general area and not organized by folders or other structure. Talk to other clients and don't believe everything sales tells you about it's capability which is a good bit of advise for any software. Talk to other clients as much as you can. Automatic assignment of learning via the learning assignment tool helps us not missing any new hires. Reporting ability on mandatory training to reduce risk. CornerStone is very user friendly, it has a seemingly well organized interface and is very easy to run/generate reports. When compared to our previous learning management system, CornerStone is much faster and seemingly more efficient. All sessions that have been added to the new system are easily edited and new sessions can be created very easily as well. Registrants can be easily moved from session to session if any changes or modifications to the date were to occur. This also allows for flawless tracking of employee learning and allows us (the administrator) to document which sessions are really in high demand thus allowing us to better serve our target audience. This in return helps us to be better stewards thereby saving money by only investing in what we know will have a strong return. I don't like that we are seemingly unable to easily contact employees registered for a session in CornerStone without emailing them via the program itself. It would make more sense for my team and would be easier if we could email registrants via Outlook but pull the emails from the program. I also don't like how the system doesn't include middle names. It's an everyday necessity for me. 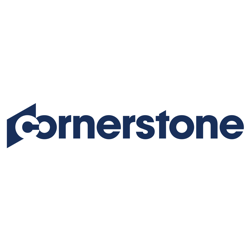 "Long time user of Learning and New Connect"
The Cornerstone LMS is a very powerful tool that can be used to automate training for both large and small companies. I like that the portals are very configurable. We have created several "custom portals" for our clients, which they love. It is very easy for students to find and request training. It is also very useful for enrollments for compliance training. There are very few APIs available for us to use to interface with our other systems. The testing functionality is very outdated and in dire need of an update. Although parts of the system are very configurable other parts are not configurable at all. It would be nice to be able to configure all aspects of the LMS. Test out the system to make sure it does what you want. We are extended enterprise so we are using the LMS to allow our students to access the course materials and to launch virtual training (via Adobe Connect interface). We are also hosting other clients training in a portal developed just for them. "Cornerstone - The sky is the limit, if you can learn to fly." Cornerstone provides a robust platform, with lots of room for implementation and further development. Although such a broad feature set can be overwhelming in most enterprise software suites, Cornerstone seems to place substantial value in making both documentation, and knowledge collaboration available to its customers. The documentation and course learning module is intuitive and covers a wide range of topics, from end-users to system administration and beyond. The customer community is refreshing and offers incentives for experts to participate, which makes finding relevant information much easier. All in all, I found that one of the biggest pros of Cornerstone was that not only do they provide a multitude of features, but they provide the tools necessary to master them. While the system is robust in its feature set, the amount of direct support from Cornerstone's support is severely limiting for questions outside the scope of what is available in the forums, and classes. When there are issues with functions inside Cornerstone displaying unexpected behavior, Cornerstone can be slow to provide a response. If you have the time and the resources to train yourself through extensive trial and error, community postings, and research + documentation, this LMS will take you far. Cornerstone provides us with a way to track learning and leadership metrics, while providing our employees with an opportunity to be proactive in training and self-improvement. "Need better client success support"
The Quarterly update sessions for my region are really helpful and help to build community locally. we don't seem to get much support when investing in new modules, our CSM is MIA, no check-ins, or how's things going? not sure what the client load is but does not feel like client success focus. It would be great to have good examples of best practices as we create new functionality on our platform, i.e. IDP, it feels like we have to figure out how to make adjustments and settings as if this was never done by any client before, and we are re-inventing the wheel, spending too much time and not getting the desired results, can we get some expert guidance, on how other clients are successfully using these tools? This has been consistent for some time since we implemented the solution. Get commitment from Sales to have CSM as advocate through implementation process. The current outsourcing w/ "partners" is not a long term success focus in my view and experience. need someone from CSOD to help steward the process for a long term successful outcome and visibility in the customer organization. lots of opportunity here. Central repository for employee records, accessibility to these records and tools by leaders and individuals. broad access to tools and learning objects by all. Cornerstone (or CSOD) is a Learning Management System (LMS) that has built a name for itself. It's a big platform, and is good experience for employees to have. Similar to Salesforce, it's a standard in talent development. When I was using CSOD, I worked at a bilingual company so we were able to do some minor user integration with English and another language. Very bulky, takes a while to learn how to use, not particularly user-friendly or interactive. Hard to navigate, and really confusing. In fact, it's so confusing we had a rep from Cornerstone meet with us monthly to go over issues we had, and we had to learn to use various features like ILT. This LMS forces you to be spreadsheet heavy. I would use this if you are looking to implement this LMS for a longstanding and large company. I don't think that this is as interactive as other Learning Management Systems, but if you're in corporate and you have more important priorities, this is a good service to use as you have ongoing support and capabilities suited for large employee counts. You'll be paying a lot for CSOD. We had just gone through an M&A and Cornerstone was able to do integrate with our HRIS to add and update users automatically. "Cornerstone's Learning solution: helpful, but frustrating"
On the admin side, Cornerstone makes it easy to store and assign content. For users (in our case, employees) Cornerstone makes it easy to find and complete content (esp. mandatory). It has helped facilitate onboarding and automate many previously-manual L&D processes. There is a steep learning curve as an admin in CSOD that I feel I am still climbing after two years as a co-administrator of content in the system. Issues we've had have ranged from large defects in integrations to small sloppy inconsistencies (e.g., checking a box to delete something vs. clicking on a trash can) that make re-teaching the system more difficult than necessary. We've had to design a number of workarounds to solve for a lack of desired features. CSOD Support leaves tickets unattended for long periods of time and is generally unfriendly in responding to issue and requests. "Ugh, Cornerstone" is a common utterance within our team of admins. Automation of mandatory compliance, security awareness, and general onboarding content has been our biggest benefit. We were also lacking a central record of resources and ILT attendance before implementation. "Excellent tool for training and performance management"
The ability to access a multitude of learning / development activities and training sessions from a single portal is very handy, as our organisation has a variety of development channels it is extremely helpful to have these all sitting under one roof - accessible from a single portal. I like the fact that I can access development tools and performance tracking tools within the same portal, it is almost natural to have these alongside but not all performance managements systems I've used have this ability. The audit and comment function on Goals and Performance Review is very handy and allows me to keep track of where I am and to exchange comments with my manager as and when required. The certificates that you get after completing an activity are quite cool and a nice motivator. The options on the Curriculum training is not very intuitive when you have a number of interdependent tasks that open up as you mark another task completed. Excellent tool for training and performance management - if you are looking at implementing it, ensure you have a skilled administrator to manage it and ensure it is intuitive, user friendly and consistent. Participate in learning activities to build knowledge and skills, develop goals that drive professional growth. Work with your manager to get the feedback you need to be successful in your role. Our Company uses Cornerstone OnDemand for our Performance Management and LMS. Because we use ADP HRIS all our information feeds into the Performance Management and LMS systems and Managers can view all their direct reports information. They can complete the performance reviews easily and assign any necessary training. The system is great as is but it is limited in the customization you can have on the home page without paying for a re-design. However if you do have budget the customization options are amazing and can really allow you to brand the system for your company. It is our one stop shop for performance management with link included for training for all our users. We are building out our LMS portion to move more training on online to allow employees to complete at their own pace. What I like best about Cornerstone is the way I can easily track my progress in my career field. It makes it quick and simply for my manager give feedback on growth and setbacks.Any additional objectives needing attention can also be found on my dashboard as well. The only thing I dislike about Cornerstone is the the setup of the website. I personally feel as if there is an extremely confusing setup for no reason. While many tabs can be easily accessed there are other things that don't make that much sense as far as layout is concerned. I HIGHLY recommend Cornerstone OnDemand for all employers and employees. It's so easy to track performance as well as keep up with your won growth. It puts the accountability on the company as well as workers making it easier to reflect. I don't have any "business problems" to solve per say. I mainly have only objectives to finish at the end of each quarter. Usually reflections to do of my own or of my direct manager and principals based on performance management. Cornerstone makes it relatively simple to assign learning and track your team's progress. The system as a whole feels far out of date. The search function is abysmal and the reports are often completely inaccurate. Look into another system. While it'll get the job done, it certainly is not the most innovative or easy to use. You may find something else offers more and fits your budget. Compliance is incredibly important in pharmaceuticals. Cornerstone helps us keep track of mandatory courses relatively smoothly. "Could it be any clunkier?" It works for training registration for our instructor led trainings. It seems to have little down-time. It offers tools like evaluations for instructor led training. Trying to navigate the system is a nightmare and their "on demand customer success center" is extremely difficult to navigate and timeconsuming to find answers to specific questions. I don't recommend Cornerstone as an LMS or the Cornerstone OnDemand customer success center. It seems like in trying to be a jack of all trades It is possibly a master of none. At least it doesn't seem to work well for the ones I've investigated..
We just use it to allow clients to register for training. I am trying to add evaluations to the trainings, but this is proving difficult. "Very user-friendly, complete HR system"
Great interface! Highly customize-able. Very easy to build, administer, and participate in trainings. Intergrates well with other systems, including Workday. Great tracking and dashboarding. Can be difficult to modify and administer. Does not work well with mobile devices. A bit pricey and not the easiest to install, but the functionality is all there - HR, onboarding, LMS, performance tracking. It's a great LMS, if it adds more value than it's worth, so it's probably not right for every company. Primarily using Cornerstone for company-wide learning and training tool (including compliance and awareness). Easy to disseminate to all users and track performance and completion. "Support is lacking and company focuses on initial sales rather than good customer service"
Helpful to have an LMS system in place. Office Hours program is beneficial. Not enough attention to user input before launching new features causes the enhancements to fall short of being valuable in more than just one static scenario. Pain points remain problematic for years and years with no hope of improvement to inherent design flaws. As a basic LMS it will meet the need, but it will cost additional for every tiny work order you need when the system doesn't readily function as you need for a project. It does not scale well if you have over 10k employees. Often runs extremely slowly, especially in pilot portals. Automated enrollments for Corporate compliance assignments. Easier reporting and tracking. "Getting more and more user friendly"
I Like the new features, for example Reporting 2.0. It looks like the tool is getting more and more user friendly. It's very complex sometimes. Also, some of the training available on CSC are out of date since they refer to older versions of the interface. The information in the help pages is well organized but sometimes difficult to find or understand. I would like to see more videos or demos. This client is easily customized to tailor your business needs and allows for governance to be regimented or lenient as needed. Usability is especially easy for basic users and moderate for administrators. Standard reporting can occasionally duplicate or provide unreliable data. This can easily be avoided by using custom reporting. If using this system for a large business, consider a pilot system for administrators to learn and create a library of job aids on processes that require multiple steps. My business migrated from SuccessFactors to Cornerstone OnDemand two years ago and begin rebuilding our learning objects to reduce redundancies, be more user-friendly, and provide flexibility for learning for multiple levels of stakeholders in a retail business. "The product looks good but is not for everyone"
The overall interface for users is clean and modern. They have an excellent client support site with plenty of training options and forums to discuss issues with other administrators. Their certification module is underdeveloped and inconsistent with the rest of the LMS module. We need this functionality because we are heavily regulated but continue to run into issues on both the user and administrative side. Because this is an optional add-on module, many of their customers don't have it so their is not a lot of priority for them to update. There are other administrative functions that are cumbersome at best. It seems like Cornerstone is focused on updating their product line like expanding into HCM and Analytics and their interface but there is a lot of core functionality that needs to be updated. Follow best practices for any new project including a thorough requirements gathering. Bring anyone who will touch the product into that process and make sure their requirements are captured. When you meet with Cornerstone, ensure that what its features match your requirements and that they are all in production in the system, not just in development. Talk to other customers who are in your industry and/or have similar requirements to see what their experience has been. As with any software vendor, when you get to the end of the year or the quarter they will offer you all kinds of discounts to sign the contract. Don't let this rush you into making a poor decision. Before Cornerstone we struggled with training records management, especially with compliance-related training. We also were doing all of our performance management including annual reviews and goal setting on paper. Cornerstone helped us "digitalize" and standardize many of these processes and has helped our record keeping in those areas tremendously. "implemented learning, performance and succession clouds in own company"
User friendly application, modular and salable with great features. Especially the on going upgrade due to SAAS is a great plus. There are certain limitations in the leaning could when an organisation needs to "push" learning. Although the functionality is there, the system is more on the "pull", so user driven learning than "push" from top down. Clear requirements and scope before starting engagement. Build gateways in you implementation plan, where and how you can keep up scaling or simply stop and change. Manage your content : keep your users experience high, engaged and deliver what is promised to them. Involve your end users early to get a feel and manage expectations. Enabling a self directed and agile learning organisation. Performance management, succession and workforce planning. The user interface is clean and our users really like the ease of use. We can control the security permissions to allow users to have some, most, or all features available to them. And we can control it by location which is important to us. Every time we want to make an enhancement there's no easy way to get it done. We can't pay to have updates made me have to submit a suggestion and hope others see the value and vote it into the system. At times this is frustrating when our enhancements aren't wants to us but needs due to an audit finding that we can't close because we can't make necessary updates to the system. List to what they are saying and not saying before you sign the deal. Ask to meet with others besides the sales team who will pitch you what you are looking to hear. Make them show you real life examples of how they will meet your needs - it will save you a lot of time later. Buy the most expensive support package you can afford because the support can sometimes be painfully slow. We use the LMS portion of Cornerstone OnDemand and the comprehensive reporting helps us to stay compliant in audits and in our day to day maintenance of the system. User's are able to clearly see on their homepage which courses are incomplete and receive automated reminders of upcoming and overdue training which helps us with our KPIs. "Cornerstone OnDemand an Organic Product that values feedback"
The product is very robust and provides so many possibilities that giving feedback and getting support is crucial! Cornerstone sincerely values feedback from their users and gives support in various ways. Aside from the company's online Help, user guides, and user forums, if I am unsure of how to do something I can reach out during daily "Office Hours" to discuss my scenario or I can call customer support directly. We also have a great rapport with our CSM (Customer Service Manager) whom we can reach out to for unique situations and along with our quarterly meetings. On top of that there is also an opportunity on a quarterly basis to network at a regional one day event with other Cornerstone Admins. We have had many of our customers find great value in the Performance Goals feature and managers truly prefer doing their annual reviews and periodic goal reviews in the system. Cornerstone has releases that occur on a quarterly basis and keeping up all that is newly being released or updated can take time, if you do not have a process. Make use of your implementation team they make a big difference and then network with other admins at the quarterly User Group meetings. They are helpful for all. We use the Learning, Performance, Succession, and Connect modules. And truly each piece has helped us to streamline and improve our processes. Reporting, user navigation, course assignment and setup. Online community to seek help from other users and you never feel like no one is home to help you out, even if the support is hit or miss. Support. Luckily we have networked good relationships with people at Cornerstone to get good help. The generic feedback you get is vague and often times the equivalent of dealing with a disgruntled Subway worker, you feel as if you're inconveniencing them. Chose for a quick easy learning experience. A simple way to navigate and create course content. Help is at your fingertips if you want to research and find it through the awesome online community. If you need specialized help you can schedule to sit in at any of the 5 office hour webex meetings for help where your receive free personalized service. Sometimes you can get poor service through "quick" help methods such as phone or e-mail. You'll often be directed to open a work ticket and wait for help, which is fine if your issue isn't urgent. Training, course library housing, daily course assignment, hiring and onboarding. We are able to create reports for a diverse work group and give accurate information to all of our branches based on training completions and assignments; this directly relates to performance reviews and compliance standards that ensure our company are up to par with the competition. Cornerstone gives us a way to house training and easily create curriculums, store and manage learning objectives and even upload our own in house created course content. "Customization platform to fit a wide variety of HR needs"
There was an abundance of functions/customization options available to use to build an interface that was appealing to the user. We utilized the built in widget options, the dashboard and more. In creating either online webinar sessions or registration pages, we were able to offer full details on the curriculum or event that was taking place. Including uploading docs, other important information that the user may need. The registration and wait list options allowed us to track our employees attendance and the popularity of the sessions being offered. The ability to send out customized email confirmations using our own company default (outlook) worked well. While the customization options worked well in most cases for us, it also created complications. It either hindered what we were trying to do or we were not made aware that the functions that were available. We needed the ability to track class/webinar/event registrations and run reports that included various data points that needed to be referenced. Including status of compliance course progress, year of completion and other related data to the courses being offered. "Industry Leader in Talent Management"
Cornerstone is a leader in the talent management industry and it shows. The technology world is fast moving and with it there are quarterly enhancement cycles to continuously improve the product and meet our client needs. Our users find it easy to use with little need for user guides or quick references as it mimics the layout of common sites that users are familiar with if they navigate the internet. The Search tool is robust, the ability to customize top-notch, and we have found the reporting to be a powerful tool. Beyond the system itself, the support we receive from Cornerstone as well as other clients has been a game-changer in how we leverage Cornerstone to offer our users the best of the best and aid in their learning and development. At times it feels as though Cornerstone is growing faster than it can keep up with some of the demands of it's "older" features. Clients have a voice in the direction of the product and priorities in enhancements but there have been some small enhancements that clients have been waiting for while seeing other parts of the system expand. I would say having more support with product development and user experience would easily diminish this. Get together a list of everything you demand out of the product and provide use cases that can be showcased. Make sure it can meet your needs first. Ask questions not only of Cornerstone but of other clients. Cornerstone has created an awesome network of peer to peer support with its clients as well as a forum to get your questions answered and find unique ways to better use it. Take advantage of these offerings. There are numerous business opportunities that Cornerstone has guides us almost seamlessly through. We are able to deliver virtual content across a large region, add an easy social learning platform, get relevant content out to our learners in time and on time, as well as automate a lot of our processes allowing us to better serve our customers and devote time in other areas. Everything looks great on paper, but it is not well received by our employees and it seems to take a great deal of effort to implement different features. Requires a full-time employee to run this system which we don't have. It is a little too complex and robust for our needs (500 employees). Hire a full time admin and designate someone as the project lead for implementation. We set this up with a handful of people giving partial attention to the project and I don't think we are making the most of its features. Compliance reporting is helpful as well as the global search feature. The performance management team used to do everything in Excel and they are thrilled with the electronic management of this process through CSOD. I like the search feature best, it's easy to use if you can't find certain things in your transcript. The support during implementation allows you to begin to use the product from the start. The support continues through both official channels and through client user groups. Finally, the product gets periodic updates that improve functionality. The only thing I can think of is that the platform is robust, so it can take some time to learn fully. You can use it from day 1, but it will take time to develop properly. Invite the team in for a trial and demo. They can assist in so many ways that you may not even know you need. We have centralized all of our training and are now able to track and report on it as needed. This allows us greater visibility and was to plan for the future. "While it may meet developers expectations, the end user gets an old school experience "
This review is based on using the Learning suite and parts of the Performance suite. My company uses it to register thousands of learners into mandated and optional trainings. It keeps that data well and serves as our system of record. What our learners see and experience distinctly lacks contemporary design and often there are so many clicks to get to what you want. The standard reports are just too basic so we always have to design custom reports and use external software like Tableau to report them out. Registering and confirming learners for our training unit’s catalog of learning programs. "Fully customizable LMS client that makes employee learning a breeze!" The functionality of the system is good overall, it's fairly intuitive and generally meets the needs of all levels of stakeholders. Some of the processes can be clunky and the functionality slows with shared computers. Troubleshooting aids go hand-in-hand with daily use. Create customized troubleshooting guides to aid stakeholders with any challenges that arise. The help options within the system aren't specific or detailed enough. It's a one-stop-shop for e-learning and can house training for a multi-dimensional company, which makes it easy for employees to find relevant information for anything from on-the-job training to development. We use almost every module of Cornerstone and love how everything works seamlessly together. We honestly have not found a downside to using the software. So far so good, so its a highly recommended Software to switch to if the company is allowed. and implement everymodule they have, as they are very useful. With each of the modules we use it has helped us streamline the process, cross talk with other departments and the ease to complete the task has been much better. A powerful tool for creating and tracking training. Putting large curricula together? Easy! Yearly compliance trainings? Easy! Found a YouTube video you want to list as training? Easy! Reporting is powerful and requires little manipulation outside of the system to show meaningful data. Enhancement requests can be a bit of a pain to get. However, I recognize this is due to the fact that not every enhancement will get its own preference (meaning it would affect all customers) and there is limited customization of the code on a per customer basis. Reporting on what hasn't happened (for example, who hasn't completed some sort of compliance training) can be difficult in some situations. Have detailed standards and processes prior to going live such as naming standards for learning objects and process documents for filling in details and options. Building these after the fact is challenging and may mean that reporting data is close to useless. One of our in house tools has specific training requirements. These requirements were previously tracked manually and infraction reports run frequently. The process has now been automated using web services to check transcript data. I’ve been working with Cornerstone products for 3 years now at two different companies, and I’ve been impressed and satisfied with the overall system and functionality offered. Of course, the more modules you have in the system, the more impressive the analytics and integration of the data you load, but even with just the Learning and Performance modules it’s a great tool that provides wonderful talent and learning administration and reporting. Over time, the interface has become more and more user friendly, and now with the new Universal Profile and system updates related to that, users are presented with a familiar, facebook-ish feel that is easy to learn and navigate. Another very positive direction Cornerstone has taken is to create a more visual, image-based interface, although there are still pages that are being updated to create a complete and consistent look and feel. I’m also a huge fan of the reporting options in the system. As far as custom reports go it takes a little getting used to how information is pulled, but once you know the system and the data, you can really pull all sorts of information. They recently made it even better because you can build graphs in custom reports now, which makes it easier than loading the data into excel and doing the work there. Overall though, I really can’t stress how easy it is for admins to navigate the system. Sure, as a System Administrator things can get a little more complicated as far as maintaining security/permission roles and deciding back end settings, but for the people in your organization that you designate as training coordinators or instructors, it’s really simple for them to learn how to run reports, enroll employees, add events and sessions, manage rosters, etc.. There’s also the option to build custom pages which is super cool! I’d never really learned much about HTML coding, but recently suggested we build some of our organization’s new performance management programs as custom pages in Cornerstone rather than in SharePoint…..meaning I ended up having that job…..and it was so easy to build some really cool, functional pages. With minimal experience (and a lot of web searching on coding), we ended up with some really great pages that connected to other areas of the system such as signing up for classes, etc.. Having the Data Load Wizard has been a great asset too in order to feed large amounts of data into the system without having to enter lines one-by-one. All in all, I’ve definitely enjoyed working with the Cornerstone system and its wonderful employees! I went to their Cornerstone Convergence conference last year as well, and all of the products they offer and how they fit together to provide amazing features like predictive analytics is super exciting to see! Cornerstone definitely has a vision and is on the cutting edge of Talent and Learning Management. As I said above, although the reporting capabilities are pretty amazing, there are also some issues with the data pulled. It's important to understand what you're getting and how the data is collected on the backend before trusting the accuracy of the report. There have been times where an employee completed a class, but the report says they haven't, because the system is pulling the MOST RECENT data, and the employee accidentally signed up for another session of the class but then withdrew when they realized they already took the course, leading the system to pull the withdrawn status, not the completed. Of course all of the data is there, you just have to be smart and double-check your results sometimes. I'll also admit there are times where we may run up against issues with what we’d LIKE the system to do, and what it is actually able to do, or system errors that need to be looked at on the Cornerstone end (something like emails not firing the way they should, or an area of the system not working the way we thought it would), but every time I’ve had problems and I’ve reached out to their Global Support or to our Client Success Manager, they’ve been extremely helpful. Global Support may not know the answer right away but they always get back to me with a fix or answers to why things are happening, and our Client Success Manager (at both companies I worked for) went out of their way to help me troubleshoot and find workarounds to suite our needs. Working with the Cornerstone learning module definitely shortens the time it takes to manage classes, registration, reporting, assigning compliance training and tracking completion. Evaluating training is also much more accessible to report on and draw conclusions from, rather than utilizing a paper system. As far as Performance Management - it's just such a great system that makes for a consistent program used across the city and gives the option to connect classes and learning opportunities to competencies and development. Right now the company I work for is trying to create a consistent perf manag program and Cornerstone is a lynchpin in that process. "Pay-per-feature rich and slightly antiquated feel"
There are many options available for setting up various LMS learning object. Cornerstone has been around a while and has obviously built a lot of options into the software. The interface and user experience are not friendly. Setting up objects often requires navigating to 3-4 places on the site. The integration options really leave a lot to be desired. To use APIs or an FTP site to transfer data without support from CSOD is an additional cost. Make sure you have your requirements outlined before scoping cost and get answers from the sales team on which features are included with cost and which are add on. Most seem to be add-ons. We are in the process of rolling out a company-wide LMS that is replacing several older processes managed by department. "Improved usability - still not intuitive"
The progress bars. As a manager its easy to evaluate how far along in a long goal and employee assesses themselves to be and is helpful in realignment conversations. This system continues to struggle with intuitive usability. For instance, there is are several places and ways people can enter or maintain goals, but none of these are connected or interchangeable. We use Cornerstone OnDemand for performance management. I am not a fan of this system and find the lack of intuitive features frustrates people on my team as well. "Cornerstone Taking Training to a hole New Level"
The option of create custom pages, this is not only useful for our coding process but for the final material to our users, when you take care of the continuous education of your people they take care of your business, this is a reality on our Talent Management Team. There's not that much of dislike with the platform at all... I might say the little lack of support for international coworkers who need to reach out a global support, It might be really helpful to have regional support and/or training. I love that Cornerstone is continuously looking for the best way to advance and up the bar in all aspects of Talent Management. They take the clients opinion and work their road map around OUR requests. They are in the business to work with their clients and make the best user friendly modules. They also work to help other clients work together and network or share ideas of how they are using the different modules. Whether it be at the annual conference, quarterly offsite meetings with other clients or connecting in their Client Success Center they make idea sharing easy and encourage it! Sometimes it takes a few releases to see the full picture of a newly released function and decide if you are going to launch it to your full audience. Working with Global Product Services in the past has been a bit of an issue trying to get tickets resolved and while CSOD has made incredible changes over the last year, sometimes we still run into a problem here and there where we need to reach out for further assistance. Cornerstone is a great tool that allows you to pick and choose what modules you want and don't want to use, whether you are purchasing the full suite or just one available module, remember to look at the full picture when deciding to either go with CSOD or another provider. If you aren't sure that CSOD offers the module you are looking for or if you don't think the system has the capability, ask. The system is very robust with continuing advances at least once a quarter. We are based in multiple countries with multiple languages and Cornerstones presence across the globe helps us to bring our stakeholders up to speed and present something to them that is not just Americas based it is truly a global tool that everyone can use with the help of different language packages and Cornerstones multiple provider relationships we can work to make sure we touch on everything that is needed across the globe and business units. "Comprehensive and flexible with great product support"
While considering Cornerstone, I encourage you get connected with current clients early on in your process so that you can learn from their implementation experiences and their current expertise. Previous to implementing Cornerstone we had a very archaic database to enter training records, rosters sat in a drawer, and we relied exclusively upon Instructor Led Training as a delivery mode. We have vastly expanded our bandwidth as a department, we are able to offer multiple training modes to include video, online courses, and job aids that can all be delivered through one streamlined solution. It has offered a way to organize multiple training programs simultaneously as well as report at multiple levels of the organization and deliver customized learning solutions to targeted audiences. The customized reporting is so easy and helpful. The report features alone have vastly improved our productivity and communication through every level. "Cornerstone helps our employees at their pace and schedule"
My favorite is the ability for our employees to complete their training at their time and pace. With the ability to use Cornerstone on their mobile devices, we find that our employees are exploring more content than they have in other learning formats. I wish that there were more books and tedstyle talks. While I know the community is constantly expanding, this is one area that our employees are constantly looking for more. With the integration into Workday, we see this being an added benefit to tracking employees career pathing objectives. For instance, I can easily pull a report which shows me who is taking classes such as "Is Management for me?" I like that Cornerstone provides a simple and well laid-out platform to view trainings that you are required to complete. You can easily view and manage the status of trainings. I dislike that I have to manually enter my username and password to sign and completel a training. It is tedious and time consuming. My company uses CornerStone to assign mandatory trainings. It is beneficial to manage progress and easily find and review previously completed trainings. One of the best aspects of CSOD is reporting and analytics. CSOD gives up to data, real time reporting on a number of data groups which makes reporting simple, quick and easy. This feature allows managers to see trends and delegate resources more effectively as well as ensure compliance for their direct reports. There a couple of areas in the system I feel could be enhanced such as a way you could manually load completion dates for curricula and a way to report out on Proxy Enrollments. Overall great system, it takes a lot of the redundant work out of learning management. We utilize CSOD for all of our online and Instructor Led EHS training. We also use CSOD to assign, track and certify our unit operators for our chemicals division. Using Proxy Enrollments for our compliance training ensure that the correct populations are receiving the correct training at the correct frequency and all records can be access from one central location. We just recently transitioned to the Cornerstone system from the Chex learning module system. Cornerstone offer so much data and so many options that it's easy to get lost in the information/lessons. It takes a bit to get used to, but once learned, the system is functional. It's easy to get lost and get buried in the windows and information. It handles what it's needed to handle with large groups of people across multiple campuses. It may take you in circles but you'll get there. Recent updates in Cornerstone has made candidate profiles look visibly appealing. We primarily use it as an ATS and performance management across our organization. I appreciate that the system has many different functionalities such as being able to upload many different training types and send them out in various forms or fashions. It is helpful to have the success center and be able to research and review what other users are doing in the system. Often times when I have an issue it is likely that someone else has already had the same issue and can offer input. I dislike that there is no "undo" button on many features. There is no easy fix or undo because the system is so large. We had an admin that was completely over their head and did not ask for help and they created total chaos in the system and it has taken almost a full 6 months and countless consulting hours with Cornerstone to get the system back where in order. Cornerstone has allowed us to centralize our training. Before Cornerstone, employees were having to go to several different sites for various training types. We are able to house and track our training in Cornerstone, which has been extremely beneficial to our end users because now training is in one spot and it is a single sign-on account. "Cornerstone as Tool to Manage Employment Tools"
I do like that there is a hub or portal where I can access all reviews, documents, paystubs, opportunities, etc. It is very convenient to go to Cornerstone and access and locate anything I may need in relation to my employment with my company. I have used it to also access professional development within my company. It can sometimes be confusing to navigate. I wanted to print out my W2's and had to use the search function to locate. I do not know if this is how my employer has set up the page, or if all Cornerstone is structured that way. I think it would also be helpful to have training to utilize the product. Give your employees training on how best to use Cornerstone to meet their needs rather than just saying it exists. I use Cornerstone to look for opportunities for advancement within my company as well as find information related or pertaining to my pay stubs. It also is a management tool for my formal observations. The end-user experience is really solid. Our users have been extremely pleased with the platform. We were used to an antiquated system, so having this fresh, new experience has been extremely beneficial. There are many things I dislike about Cornerstone. The administration of the system is cumbersome. There are many things about the system that are unable to be modified, making it very difficult for us to use it to meet our needs. We have had to change many processes to accommodate. Different aspects of Cornerstone that should be similar seem to be completely different--making me believe that the different departments are siloed within the organization (i.e. Curriculum and Certifications). The technical help we received has been lacking. We are very disappointed with our customer service experience. Cornerstone does not do a good job managing their third party vendors, and getting help when needed has been very difficult. We have had several experiences where we have had to wait over 1 1/2 months to get the help we needed, which is unacceptable. It is a good system, just make sure to have a proper contract review and do not leave anything non-specific. We replaced an antiquated system, so Cornerstone has solved many of our needs. Although the administrative side of Cornerstone has not been a good experience for us, our end-users are experiencing many benefits, and that is the most important thing. "Powerful, flexible and easy to use learning system"
The ability to deliver learning across the organization for various different approval processes and needs. We have an integration with Workday and wish that the integration was a little more flexible in regards to the user data that you can get from that integration. We are able to target audiences and deliver just in time learning in a very automated way without having to manually manager audiences ongoing for various training needs. * We monitor all Cornerstone OnDemand reviews to prevent fraudulent reviews and keep review quality high. We do not post reviews by company employees or direct competitors. Validated reviews require the user to submit a screenshot of the product containing their user ID, in order to verify a user is an actual user of the product. Hi there! Are you looking to implement a solution like Cornerstone?